A month or so ago I was contacted by two inspiring American women who are training for an ‘ultra’ cycling event called Race Across America. It’s a 3,000 mile or 4,828 km ride that has to be completed in nine days. I always thought that undertaking a long ride like Melbourne’s Around the Bay which is 210 km was a pretty impressive feat. That was until I heard from Kacie & Dani. I asked them a few questions about their quest. How did you both start cycling? Kacie: I did not grow up an endurance athlete. I was never interested in this kind of thing until I married my husband, George in 2007. He had been a collegiate athlete, but had not been racing for a while. He was interested in getting back into it, but it was tough for him to get going. I told him that I would do a race if he would, and he was shocked! So, we signed up for a duathlon (run-bike-run), and we trained for it. I was literally training from scratch. I bought a flat-handle bar bike, and started running a few minutes at a time. I loved the training, I loved the race, and I couldn’t wait to get more. In a few months, I bought a road bike, and kept riding longer. Dani: I grew up doing very traditional sports. Cheerleading, dance team, basketball, softball, I was always very competitive and driven to do well. In college I gained a lot of weight, and in September 2005 found myself tipping the scales around 225 pounds (102 kg). I made a serious commitment to get healthy and lost 70 pounds (32 kg). I started taking a spin class at the local gym and met some triathletes. I admired them so much for their work ethic and determination, I decided it was something I wanted to do too! The first ride I did was in 40 degree (4.5 degrees celsius) weather. I showed up in yoga pants and a long-sleeve t-shirt. My pants kept getting caught up in my chain and ripping. I was such a novice and knew nothing, it’s funny to think about how much has changed since then! How old are you both and where are you from? Kacie: I am 29, and I am from North Georgia. How long have you been riding ‘ultracycling’ events or is this your first one? Kacie: I was first into triathlon. I did four ironmans, and plenty of half-ironmans. I have run a handful of marathons, and won a 50 km trail race. After a few ironmans, I realised that I wasn’t really very tired at the end of the races. My husband said that I should either go faster or go longer. So, after going as fast as I cared to go, I found a double Iron, which is 4.8 miles (7.7 km) of swimming, 224 miles (360 km) on the bike, and then a double marathon (84 km). During that training, I became friends with Dani, who was also training for that race. At the end of the race, I ended up with stress fractures in my legs, and I couldn’t run. My doctor did tell me that I could do AS MUCH cycling as I wanted. At that point, there was a local RAAM team (8-person) that was looking for another rider. So I hopped onto the team. It was an adventure for sure! When I got to the end of the race, I was deliriously tired, but I knew I would be back there. I wanted to do the race again, but I wanted to do it on a smaller team, and I wanted to do it with a team that I developed (instead of jumped on at the last minute). I got back from the race and called Dani. Within a couple of weeks, our team (Power, Pedals, and Ponytails) was born and we were on our way to racing RAAM this year. I raced and won a 200 mile (320 km) race this fall. 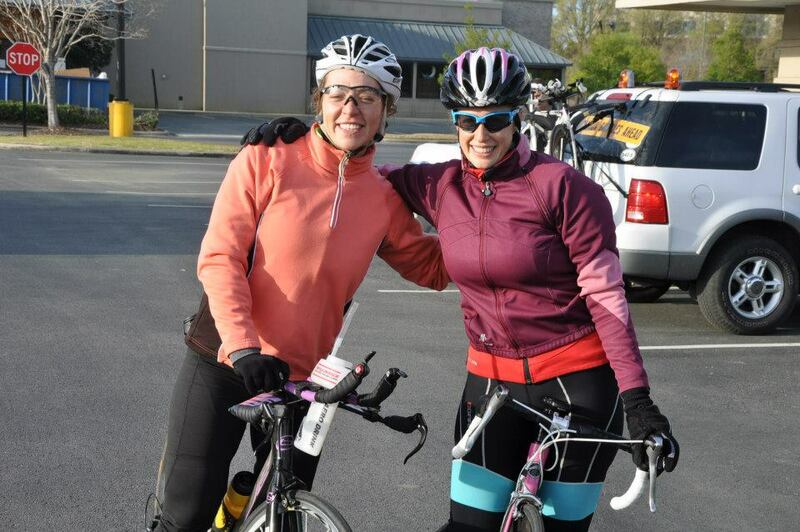 In early April, Dani and I raced a 517 mile (832 km) together, and won that race as well. We have been working incredibly hard, and we are aiming to break the two person female record for RAAM, which is 8 days, 18 hours, and 57 minutes. Dani: My first ultra cycling event was in December 2011. I did a solo-cross state record attempt that was through the Ultra Marathon Cycling Association. You can pick the state, and the direction (N-S, E-W, S-N, etc) if there is already a record in place you have to start and stop at the EXACT same place the current record holder did. You plan out your own route though, and submit it to the UMCA for approval. It requires an offical as well. I choose Florida, East to West, and rode 422 miles (680 km) non-stop. Eight weeks later I raced a double Ironman which consisted of a 4.8 mile (7.7 km) swim, 224 mile (360 km) bike, and 52.4 mile (84 km) run. In September I did a race with the format of as many miles as you can get in. It was 12 hours, I got 212 miles (341 km) in, on a tough course with pouring rain and set a new female record. Monday: Before work strength session with my strength trainer. We do weights, range of motion work, plyometrics, stretching, and we often focus on strengthing my back and neck. After work, I do a variety of things depending on the week. Sometimes I go to yoga, see my sports nutritionist, get a sports massage, or see my chiropractor. Tuesday: Before work I do a 1 hour speed trainer session in my living room. After work I ride 3-4.5 hours depending on the day. Sometimes I do a hard workout in the last 1.5 hours. Depending on light and weather, these might be inside or outside. Wednesday: Before work, I ride for 1.5 hours at an indoor cycling studio with Dani. It gives us a change to chat about our RAAM business for that week. Thursday: Exactly like Tuesday. Morning hour speed work Afternoon 3-4.5 hours of riding with some hill and speed work. Friday: Strength in the morning. Sometimes yoga in the afternooon. Saturday and Sunday: This varies a great deal. Sometimes I do a workout where I am on the bike and off the bike trying to simulate relaying for RAAM. We often go to the mountains to climb and ride really hard rides. Sometimes we show up to long group rides to work on our speed. Weekends are tough, but they are when the biggest chunks of work get done. We will also be working on some night riding in the coming months. Saturday and Sunday: I get my longest work in on the weekends. I have done a lot of on/off training. An example would be to ride for an hour, then take a 30 minute break and repeat that 8 times (8 hour total ride) I usually have a long ride that is 7-10 hours and a shorter more intense ride that is 5-6 hours the following day. You have to ride 3,000 miles (4,828 km) in nine days, how important is nutrition in this type of event? Kacie: Nutrition is very important! I am a vegetarian, which certainly makes it more interesting! As we get closer to the race, I get stricter about my out of training nutrition. In the race, I use almost everything. Gels, drinks, chews, rice krispy treats, pop tarts, trail mix, and even real food that I would never eat normally like pizza and McDonalds. You do need to eat some “real” food to sustain you for 8 days of racing. Dani: Bad nutrition can ruin someone in a race of this distance! You need to be properly fueled, with foods that you know will work for you. That is going to be an important part of the crew’s job, knowing that I might ask for something crazy like mac ‘n’ cheese but they shouldn’t give it to me. When I rode across Florida I kept asking for a hotdog. I have no idea why, I don’t even LIKE hotdogs! My crew refused to get me one, which was a smart choice. I probably wouldn’t have felt really good after eating it! What type/brand of bike will you be riding? Kacie: I ride a Blue Competition road bike and a Scott Contessa Plasma TT bike. I will have multiple sets of wheels of varying carbon depth for the different wind situation. I will also have regular helmets and aero helmets as well as multiple pairs of shoes. Dani: I will be riding a Blue tri bike (custom painted PURPLE of course!!) that I LOVE! I will also have my Scott road bike, a variety of carbon wheels and regular wheels, standard helmet and aero helmet, and my trusty blue carnac shoes that I have been rocking since 2007. Do you need to carry all your own spares, etc. or is there support vehicles? Kacie: We will have 10 crew members with us and three vehicles. One will be my follow vehicle, and one will be Dani’s. The third one will be a “rest” vehicle for the crew and for us. How many people usually participate in the event? There are about 300 people per year on teams and solo. Read the FAQ about the race here. Why did you select Camp Twin Lakes as your favoured charity? Kacie: I am a school teacher, and I think that all children should have the opportunity to enjoy their childhoods. Camp Twin Lakes is a camp for children with illness and disabilities. I have participated in some cycling fundraisers for CTL before, and it was incredibly inspiring. They make it possible for any child to enjoy summer camp and simply be a child! They believe that anything is possible, and we belive the same thing! It is parternship that we are proud of! Here is how to follow Kacie & Dani. Awesome article Nic! Very motivational. Would love to read about their post race experience.